KoopaTV: KoopaTV's 2017 GOTY Awards! By LUDWIG VON KOOPA - Game of THAT Year 2017... and other categories. Welcome one and all, to the fitting conclusion to one of the best years in gaming. It was also one of the best years in KoopaTV. We get to talk about what's best for both gaming and KoopaTV (sometimes, those CONVERGE!) in this article! Quite frankly, I'll be happy just to get this over with, since it's been nothing but arguing all weekend. Very intense stuff behind-the-scenes, believe me. Follow along with all the items that were nominated by checking out KoopaTV's 2017 GOTY Nominations. We have a policy not to disclose which staffer voted for which game. The winner of Best PC Game of 2017 is none other than... Soviet Missile Run! ...The fact that you can play it for free right on KoopaTV makes it all the better. So...We voted for Team Kirby Clash Deluxe for the Best 3DS Game of 2017. Yeah. A free-to-play boss rush won. I mean, the 3DS doesn't have that much going for it anymore, right? The other competitors were all remakes. That score is with no potions used, folks. This wasn't close. As one of the only games that even came out on the Wii U in 2017, The Legend of Zelda: Breath of the Wild clinched it. Still, a bit sad that MOTHER 3 could only offer token resistance. Next year, this category won't be here. After sailing through the best Wii U game category, The Legend of Zelda: Breath of the Wild also wins Best Nintendo Switch Game of 2017. This category was MUCH more contentious, with every staff member voting for a different game, resulting in a tie with the games having 1 vote each. (...Yes, even ARMS, because one staff member, I won't name him or her, is a troll.) With Game of THAT Year in the balance, we picked the game that wouldn't result in us having the same debate for that ultimate category, which means picking a game that already won a category — The Legend of Zelda: Breath of the Wild. The Legend of Zelda: Breath of the Wild won because it's a spectacular game with a top-notch physics system that gives the player a ton of options and rewards you for creativity. The game means something different for everyone who has played it, and few games can truly say that. It's a once-a-lifecycle game. 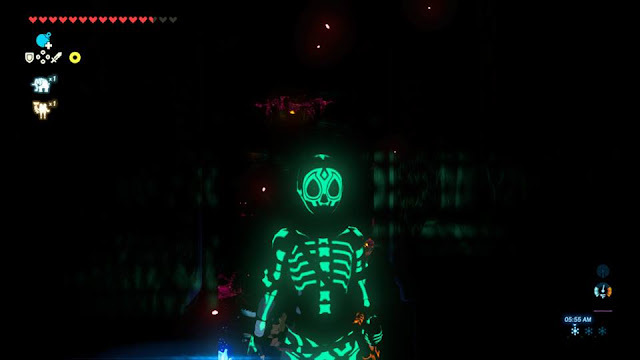 While we disagree about whether or not open-world should be THE FUTURE of The Legend of Zelda, it would be downright dumb to pretend the game isn't incredible. The Legend of Zelda: Breath of the Wild GLOWS with attention-to-detail and polish! This was a fiercely debated category, which each staffer having their own favourite character. After some claw-twisting, we have settled on awarding Hariet from Super Mario Odyssey the Best New Character of 2017 award! She's pretty much perfect, from her design, to her work ethic, to her oh-so-heavenly laughter. I am a big fan of her hatred of Mario and Cappy. 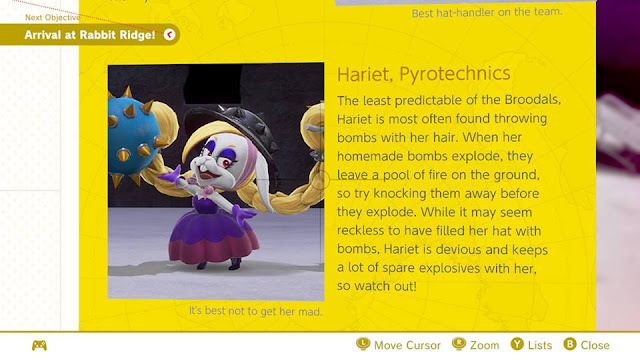 Hariet's official biography on a travel guide, which describes her winning personality. We share a love of arson. ...Erm... Let's move on to the next category. We haven't publicly discussed it at all, but privately we've had a certain someone been telling us that Xenoblade Chronicles 2 has one of the best soundtracks ever made. So we voted for it. This could've been won by someone else, but some of the other contestants have Toxic “No Music Philosophies” that cripple their chance of winning. Besides, there is something inherently appealing about the 3/4 time signature. In case you had trouble keeping count, the candidates we get to choose from for Game of THAT Year 2017 are all of the games that have won an award so far, which are Soviet Missile Run, Team Kirby Clash Deluxe, The Legend of Zelda: Breath of the Wild, Super Mario Odyssey, and Xenoblade Chronicles 2. That's a very strong line-up, and is a rebuke to the conclusion made in the GameFAQs Best Year in Gaming contest that gaming's glory days were 20 years ago. Ultimately, the game that leads that is The Legend of Zelda: Breath of the Wild, so the staff decided to give that the Game of THAT Year 2017 award. It'll still be remembered as a big behemoth of a game for many years to come. Discord won overwhelmingly. I think everyone voted for it to send a message to me to stop being a regressive jerk and embrace change. The benefits of us switching from AIM to Discord really show. We probably wouldn't have even had full staff participation in the 2017 GOTY awards if we weren't using Discord! If you think that's unfortunate, well, we've had an open spot for social media manager ever since our old one disappeared and joined ISIS. Console Launch? On a School Day? It’s More Likely Than You Think!, as well as It’s time to boycott KoopaTV, and join the Odyssey!. While I don't personally approve of that second headline (I can only speak for myself, but I don't think any of the staff should approve of a boycott on our own site), it is clear that Little Fruini does his research on KoopaTV prior to writing an article for KoopaTV. He adheres to our established narratives and themes, and adds to them while delivering value for the readers and even us, which is what we ask for when we want guest posts! While this didn't affect our decision, we can also tell you that there will be at least one more guest article from him to be published in early 2018, and we hope there'll be more! Your best laugh for 2017 can be found in none other than Look to Mario and Cappy to Solve The MICHAEL JACKSON MYSTERY!. The article is a masterpiece, from its rare (for KoopaTV) use of .gifs (perfectly coordinated ones), to its spectacularly coordinated imagery, to its very concept that is not only spot-on, but weeks ahead of where you could get anywhere else. Whether you're a Michael Jackson fan, a Mario fan (the hell is wrong with you? ), or you love a good conspiracy theory (is it a conspiracy theory if it's accurate? ), this article delivered. This article is KoopaTV at its best, and a fine piece of content to advance the ideals of the Enlightenment Movement. Congratulations to KoopaTV's Nintendo Spotlight E3 2017 Live Reactions! + Super Mario Odyssey Treehouse Live! It may look like any ordinary Nintendo E3 2017 log for half of it, but when the Super Mario Odyssey part kicks in... WOW. This is our first ever impression of “Jump Up, Super Star!” and this Rawk, Ludwig, and Vortex-joined reaction log had us constantly in amazement. Nintendo did a much better job showcasing Super Mario Odyssey (masterful) than the end-result (great). The marketing was stronger than the game ended up being, which I should probably talk about in its own dedicated article. Anyway, as for this reaction log, it is reminiscent of last year's Best KoopaTV Reaction Log winner, for Paper Mario: Color Splash. That's a really good thing. This was the log that put an end to the Alex Hunter reoccurring references that made up E3 2017 up to that point, and Super Mario Odyssey was front and centre for the rest of E3... and really, for the rest of the site's editorial direction up to recently. Regrettably, this log failed at ascertaining Hariet's name's spelling. As much as we love our other Artistic Corner entries, Vortexica's (and Tea Storm Studios) special episode for KoopaTV Adventures, showcased here, was objectively the best entry for 2017: New Donk, New Donk: A KoopaTV Adventures Special. If you haven't watched it yet, do so, dammit. Then read the aftermath here. Eclipse 2017—In The Path of Totality! — the first article in the series, which took a very hard news approach to the eclipse with tons of pictures taking you through the moment. This laid the groundwork so everyone knew exactly what the event was in literal terms. This was written by guest author Vanessa Tsukino. Go 🌒 Yourself, Fake News! — the second article in the series, also notable for being the first and only article in KoopaTV history to have an emoji in the title (didn't even know that was possible). This article took a more political slant towards the solar eclipse, discussing how the FAKE NEWS media was making up crap about how long President Donald John Trump was looking at the sun. This was written by RawkHawk2010. Why Is Angry Sun So Angry? Total Solar Eclipse! — the third article in the series. This one ties the solar eclipse into videogames (KoopaTV's nominal purpose in life), and specifically how the eclipse affected the development of the Sun as a character, the one shining over the author's head. It follows the Sun's development from Baby Sun, to Happy Sun, to Sad Sun... to the Angry Sun. Finally, we hypothesise the Sun will then turn into a Black Dwarf, causing doom for us all. Thanks, solar eclipse. This was written by Ludwig Von Koopa. Usually, when KoopaTV has a series of articles (like all the other nominated ones), they're stretched out over time and cover multiple but related events, usually covered in the same way. The 2017 solar eclipse series really shows KoopaTV's versatility in how we can approach any given event, and this microcosm really impressed our own staff members, looking back on the year. This was the last category to be decided, and not just because it's the last one on the page. With a site overflowing with bloody amazing content like KoopaTV's, we know that picking the BEST article of the year is an extremely consequential decision, made all the harder that we have personal stakes in these articles since we made them. After many hours of debate, we have awarded Best KoopaTV Article of 2017 to CNN is MIFFED at a Donald Trump GIF! for its outstanding coverage of that incident where CNN blackmailed a fan of President Donald John Trump for creating an anti-CNN .gif. KoopaTV lead the charge (and still does, with our semi-regular anti-CNN content made well after the incident) in what is called the CNN Meme War. Not only did we make a .gif of our own, but also other images with high production values portraying President Donald John Trump as the defender of truth and levity (KoopaTV's values) against the FAKE NEWS outlet CNN. But we were also very fair & balanced in our coverage, not allowing FAKE NEWS from the other side get away with polluting the public discourse. News, opinion, entertainment. That's the exact flow the best series of 2017 had, and the best article of 2017 outlined it right there for you a month before it happened. Again, the whole article is very well-written, and you can see how we don't stray from our gaming roots with our picture choices. Fortunately, the article winning this award in no way implies I need to make an audio version of it or anything, since I don't want to get involved in the argument on how to pronounce GIF. Most Humourous KoopaTV Article — Look to Mario and Cappy to Solve The MICHAEL JACKSON MYSTERY! Best KoopaTV Article — CNN is MIFFED at a Donald Trump GIF! KoopaTV looks forward to having some new categories for next year. No, Best Xbox or PlayStation game categories aren't in the works, but with the announcement that the site will recognise YOUR best and worst comments for 2018, those can now be transferred to be nominatable and votable items! PLUS, KoopaTV is strongly considering treating each KoopaTV category to be its own... voting category, instead of the current set-up. That way, it'll reflect the gaming half of these. With your help, KoopaTV will be able to survive to the end of 2018, so keep giving this site your support! ...Oh, and for this article, please give your thoughts on the awards. Why not click here to check out 2016's Game of THAT Year awards in full? Some interesting picks back then. KoopaTV makes good on the promise for category renovation for 2018's nominations. Here are KoopaTV's 2018 Game of THAT Year awards! Dang it. I was about to be grateful that no one brought up that game. If you wanted it, we had the nominations article up literally all weekend, and also called for people's suggestions for the whole week prior. That said, Soviet Missile Run is better. Your game has a severe lack of character development. There is literally character development for two of the three named characters. You're probably the same person. If that's me, then you're Wendy. But literally no one says Trashssie except you trying to be another person. But I've literally never said that. ...Yeah because it's as another person. ...And you only do that rarely. I dunno. Who else would it be? I am honored to be called upon as the best Guest Contributor of THAT year, which was a surprise. I'm also surprised that Xenoblade Chronicles 2 won the best OST, despite the dislike during the reaction log. I may be remembering it wrong, however. Whom did you expect to win? In terms of the Xenoblade Chronicles 2 during its dedicated Direct, that was really apathy more than dislike for the game. The OST is independent of the rest of the game, anyway. [6:24 PM] Rawk: Well the music is good. ShinyGirafarig? 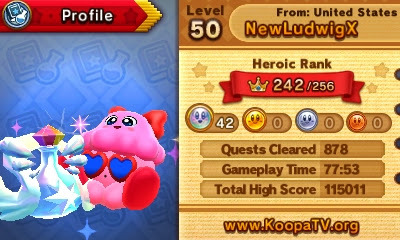 After all, she's definitely a champion of the KoopaTV Rewards Program. Quantity is a factor here. I would argue that Soviet Missile Run should have also won best new character and best OST. Varya is such a developed character with a great backstory full of interesting twists. How many games feature a protagonist who is a quadruple (or more) agent? Certainly not any others that I can think of offhand. The main theme "Soviet Missile Run" is also iconic and when you have heard it only once, it will be stuck in your head for days. The lyrics are super catchy and as I said in my review remind me of other popular theme songs. Well... There's something that Hariet has that Varya does not have (in my opinion) that I won't get into. But let's just say a write-up of Varya as best new character would be far different than Hariet's. As for OST, if we judged an entire OST based off one song, then Super Mario Odyssey would have won.